If you live in major cities in Nigeria, like Lagos, Ibadan, Port Harcourt etc watching passengers rush for commercial buses wouldn’t be new,the introduction of the BRT buses system by the Lagos state government ushered in some sanity into the sector, as passengers started to buy tickets and form queues again. Rushing to enter a plane is what i do not understand. A passenger who was on an overbooked Arik air flight from Port Harcourt to Lagos has shared his experience. 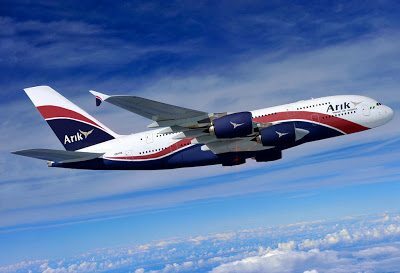 Arik Air, one of Nigeria’s popular local light operators on the 24th of October, 2013, sold excess travel tickets beyond the plane’s capacity. The flight which was supposed to be from Port Harcourt to Lagos left passengers stranded on the tarmac. It was now left to anyone who had enough power to struggle past the officials trying to restrain them from going into the plane. According to the passenger who filmed the whole drama, he was surprised by the poor level of communication within Arik Air. He said, “I was rather surprised at the service rendered by Arik Air Nigeria. We the passengers where left stranded on the tarmac and to be honest, I was really baffled and amazed at the level of poor communication within Arik Air.